HP Proliant DL380 G7. 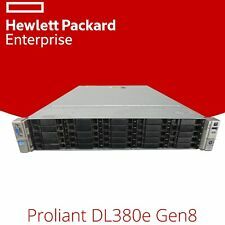 HP Proliant DL380 GEN 7. 2x 600Gb 2.5" 10k SAS Drives. 2x Redundant Power Supplies. We are able to source hard to find parts for Legacy systems through to the latest new in box parts for the latest generations of servers & storage systems. 1U SuperMicro based server with the following specification 1U SC113TQ-WIO case. 8x SATA/SAS drive bays. One of the handles on the front is slightly bent. X9DRW-IF Motherboard. Dell PowerEdge R720. We are able to source hard to find parts for Legacy systems through to the latest new in box parts for the latest generations of servers & storage systems. 2x 146GB 10k SAS. Any hard drives (if included) have been data wiped and work. Model: Foxconn 1U Cloud Server. Form Factor: Rack-Mountable 1U. All of our servers are refurbished to a very high standard. Internal parts (such as RAM and CPUs) are tested individually, and once the components are installed the system is tested in full. Dell powerEdge r710 2.5" 8-bay. model PowerEdge R710. rails NOT INCLUDED. DVD drive DVD-ROM. Lid / case (scratches) Yes. LID / CASE (dents) NONE. CPU: E5620 x 2, 2.40GHz - 2.66Ghz ,8 Threads, 12MB Smart Cache, 4 core CPU. P410i Raid Card with 512MB Cache Plus Battery. Model: HP DL380 G7. Storage: 2 x 146GB HDD SAS 10K. Buy it Now! 02-05-2018 11:20:20. Dell PowerEdge R510 Server. UPD: added 8x HDD's and Rails. 8x 1GB HDD. Rails (pls see pics). 2 x AMD Opteron 2.00Ghz 12MB Level 2 Cache 8 Core Processor. The Optical Drive is not installed as this has been mislayed. 1 x 500W Power Supplies. DUAL QUAD CORE X5570 @ 2.93GHz & 96GB RAM. 96GB RAM 12 x 8GB PC3-10600R DIMMs. DELL POWEREDGE R610 1U SERVER. Also Isle of Wight and Isle of Man and any other off-shore locations. NO RAILS PROVIDED . 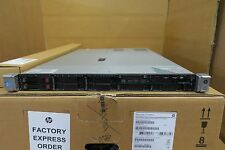 HP DL360E G8 1U RACK SERVER - 2x E5-2450L, 16GB, P420/1GB FBWC, 2x PSU 8x SFF. P420i/1GB FBWC. 8 x 2.5" SFF. 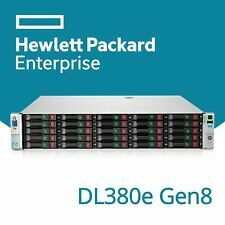 5 out of 5 stars - HP DL360E G8 1U RACK SERVER - 2x E5-2450L, 16GB, P420/1GB FBWC, 2x PSU 8x SFF. 3 product ratings3 product ratings - HP DL360E G8 1U RACK SERVER - 2x E5-2450L, 16GB, P420/1GB FBWC, 2x PSU 8x SFF. 36GB DDDR3 10600R RAM. 8 x 72GB SAS Drives. HP ProLiant DL380 G7. Fully tested and passed all HP Diagnostics. Fully Tested. Tested by onsite technicians and in full working order. Slight signs of wear, overall good condition. Form Factor: 1U. RAM: 0GB DDR3. Xeon E5504 quad core CPU @ 2 GHz56GB RAM. IBM Part Number - 7946. The server will be missing the drive blanking plates. This Dual socket motherboard supports E5-2600 and E5-2600 V2 processor series whilst allowing for installation of up to 1.5TB of RAM across 24 DIMM Slots. Form Factor: Rack-Mountable 1U. RAM: 32GB DDR3 RAM. Model: HP ProLiant DL380 G7, 2U Server, DL380 G7. RAM: 4GB DDR3 RAM. RAC: HP ProLiant Onboard Administrator iLO. Expansion: The system board has 2 PCI connectors. The riser cards provide the actual PCI slots. Supermicro 2U 8 Bay Storage Server, 8 Core, 24GB RAM, great for NAS build. QTY 1 x Supermicro 1U SYS-6026T-URF 2U 8 Bay 3.5" drive storage chassis. The systems have been refurbished and all 8 x 3.5" drive trays are included plus the rack rail kit for installation into a server rack. Quanta S210-X12RS. Dual (2x) Xeon E5-2620 Hexa-core Processors @ 2.0Ghz. 4x 3.5" hot-plug drive bays (no caddies). Any hard drives (if included) are data wiped and work. Powers up to BIOS fine without any errors or passwords. Model: DL160 G6. RAM: 32GB DDR3 RAM. Form Factor: Rack-Mountable 1U. All of our servers are refurbished to a very high standard. Internal parts (such as RAM and CPUs) are tested individually, and once the components are installed the system is tested in full. 128GB DDR3 ECC Ram. Dell Poweredge R710. 8 x 600GB 10K SAS Disk Drives. No rails included. 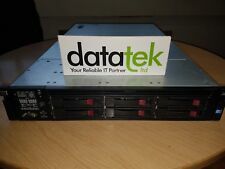 Listed item is a Dell PowerEdge R410 1 RU rack-mountable form-factor server in good condition. Video: Interfaces VGA. HP ProLiant DL380 G7 2U 2x Xeon Quad Core E5649 2.53GHz 64GB 8x 146GB SAS SP 10K. Storage (SAS): 8x 146GB SAS SP 10K. Form Factor: 2U Rackmount. NO power lead, mouse, keyboard or ANY other accessories included. Model: HP ProLiant DL360p Gen8. RAM: 48GB DDR3 RAM. Form Factor: Rack-Mountable 1U. All of our servers are refurbished to a very high standard. Internal parts (such as RAM and CPUs) are tested individually, and once the components are installed the system is tested in full. Dell PowerEdge R310 X3430 2.40GHz PROCESSOR. SERVER RACK. TESTED IN GOOD WORKING ORDER. UNIT AND POWER LEAD. New listingHP DL360E G8 1U RACK SERVER - 2x E5-2450L, 8GB, B120i/ ZM, 1x PSU 8x SFF..
Only 4x active bays - B120i supports up to 6x SATA HDD. BACKPLANE 8X SFF. To active these extra bays you will need 675856-B21 - see the quickspecs for further details. Condition is Used. Great example of a poweredge R610, 6 HDD caddies included (no HDD), iDrac enterprise. 2 x146GB SAS Drives 2.5". 2 x Six Core AMD 2431 2.4GHz CPU. NO DVD Drive is installed. Fully Tested. Dell PowerEdge R320 Local Server. Cash on Collection. Dell PowerEdge R210 Server, Quad core, 4Gb memory, 250GB drive, space to expand. It has one 250GB hard drive and space for another. Quad core Xenon processor. Access lock cage and key. PCIe slot. Front USB and Monitor port.